Find your place in the Southwest and revel in European-style accommodations that blend the charm of a tranquil bed and breakfast with the luxuries of a modern room. 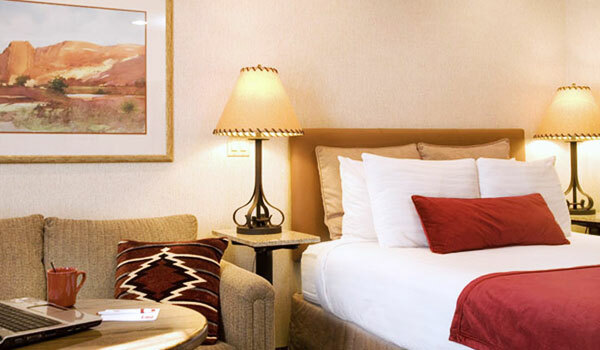 Brilliant Jemez Mountain views, vintage furnishings and custom desks outfit a range of room types from our sunset mini suites to our double euro rooms, perfect for couples or friends traveling together. Set out for a Southwest adventure with your pup and rest easy in one of our pet friendly guestrooms. When it's time to explore the shops and sights of Santa Fe, our traditional American New Mexican breakfast is the perfect way to fuel the day. 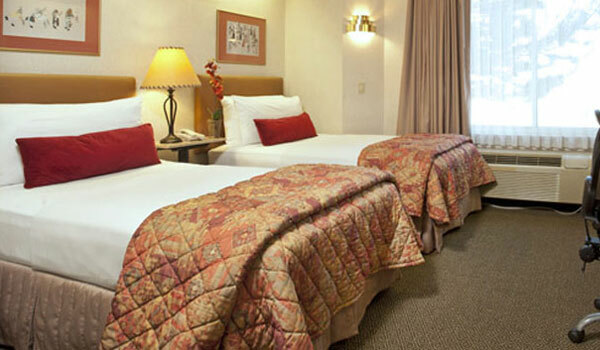 The family suite is the perfect accommodations for traveling with your family or friends. This well appointed two room suite features 3 queen beds and sleeps up to six adults. The two rooms include one room with two queen beds, no bath, adjoining a room with a single queen and bath. The combined room offers a fridge, microwave, two TVs and two DVD players. Savor a breathtaking sunset view of Santa Fe. This elegant room features an oversized craftsman headboard with a comfortable high queen bed, seating area facing the vintage armoire and a 6' custom desk. Unwind, or start that novel you’ve been wanting to write, while taking in Jemez Mountain views. These guestrooms feature one queen bed plus a sitting area with a twin sofa sleeper and high coffee table. These boutique-style guestrooms are outfitted with two deluxe queen-size beds and a custom 6' computer desk. We offer a choice of view and floor with these rooms, ideal for families traveling with children. 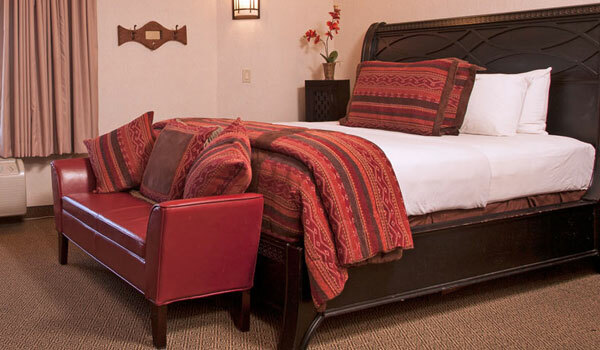 Perfect for a couple or solo adventurer, this inviting room delivers a cozy bed and breakfast experience in Santa Fe, with one queen bed and a rollaway bed on request to accommodate a traveling friend. 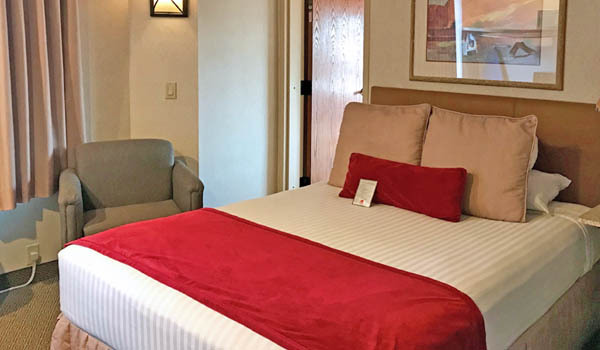 Ideal for a couple, two friends traveling together or a single parent and child, this room offers two European-size beds, 7 feet long and 42 inches wide, smaller than a double bed but larger than a twin. 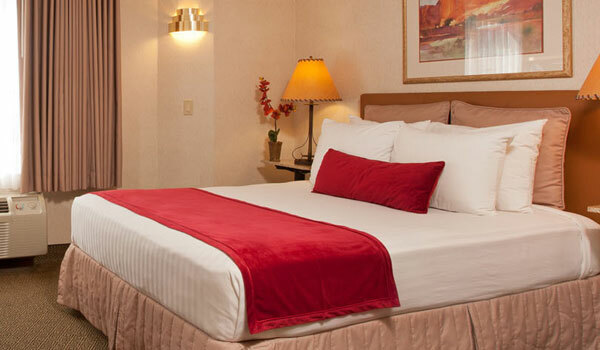 Our accessible rooms meet ADA requirements and include a queen bed, tub or roll-in shower. Hearing accessible kits are available upon request and our staff is happy to help with any additional needs.